The genius of revolution presided at the birth of the American Republic, whose first breath was drawn amid the economic, social and political turmoil of the eighteenth century. The voyaging and discovering of the three preceding centuries had destroyed European isolation and laid the foundation for a new world order of society. The Industrial Revolution was convulsing England and threatening to destroy the Feudal State. Western civilization, in the birthpangs of social revolution, produced first the American and then the French Republic. Feudalism was dying! Divine right, monarchy, aristocracy, oppression, despotism, tyranny—these and all other devils of the old world order were bound for the limbo which awaits outworn, discredited social institutions. The Declaration of Independence officially proclaimed the new order,—challenging "divine right" and maintaining that "all men are created equal; that they are endowed by their Creator with certain unalienable rights; that among these are life, liberty and the pursuit of happiness. That to secure these rights, governments are instituted among men, deriving their just powers from the consent of the governed." Life, liberty and happiness were the heritage of the human race, and "whenever any form of government becomes destructive of these ends, it is the right of the people to alter or abolish it, and to institute a new government laying its foundations on such principles, and organizing its powers in such form, as to them shall seem likely to effect their safety and happiness." Thus the rights of the people were declared superior to the privileges of the rulers; revolution was justified; and the principles of eighteenth century individualism were made the foundation of the new political state. Aristocracy was swept aside and in its stead democracy was enthroned. The nineteenth century re-echoed with the language of social idealism. Traditional bonds were breaking; men's minds were freed; their imaginations were kindled; their spirits were possessed by a gnawing hunger for justice and truth. Revolting millions shouted: "Liberty, Equality, Fraternity!" Sages mused; philosophers analyzed; prophets exhorted; statesmen organized toward this end. Men felt the fire of the new order burning in their vitals. It purged them. They looked into the eyes of their fellows and saw its reflection. Dreaming of liberty as a maiden dreams of her lover, humanity awoke suddenly, to find liberty on the threshold. Through the ages mankind has sought truth and justice. Vested interests have intervened. The powers of the established order have resisted, but the search has continued. That eternal vigilance and eternal sacrifice which are the price of liberty, are found wherever human society has left a record. At one point the forces of light seem to be winning. At another, liberty and truth are being ruthlessly crushed by the privileged masters of life. The struggle goes on—eternally. Liberty and justice are ideals that exist in the human heart, but they are none the less real. Indeed, they are in a sense more potent, lying thus in immortal embryo, than they could be as tangible institutions. Institutions are brought into being, perfected, kept past their time of highest usefulness and finally discarded. The hopes of men spring eternally, spontaneously. They are the true social immortality. Feudalism as a means of organizing society had failed. The newly declared liberties were confided to the newly created state. It was political democracy upon which the founders of the Republic depended to make good the promise of 1776. 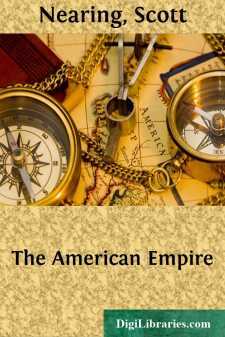 The American colonists had fled to escape economic, political and religious tyranny in the mother countries. They had drunk the cup of its bitterness in the long contest with England over the rights of taxation, of commerce, of manufacture, and of local political control. They had their fill of a mastery built upon the special privilege of an aristocratic minority. It was liberty and justice they sought and democracy was the instrument that they selected to emancipate themselves from the old forms of privilege and to give to all an equal opportunity for life, liberty and the pursuit of happiness.